If overflowing and chaotic e-mail folders are the bane of your existence, there may be help. The just updated MailWing 4 is handy organizer and archiver for Apple Mail, linking your mailboxes and mail folders to matching folders in the Finder. MailWing, created by developer Luther Fuller, used to be called Mail Saver. The latest version rebrands the app, adds support for Snow Leopard, and fixes a few bugs. Like Mail Saver before it, MailWing creates copies of your messages as documents that live independently from Mail. Saved messages retain attachments, and you can reply to and forward them just as you would a regular message in Mail. Once you’ve copied the old messages, you can delete them from the mailbox itself if you’re running up against size limits. Within Mail’s rules, you can set up an automatic routing for messages to go to the linked folders for safe-keeping. A different feature called Mail-Safe Archive creates a disk image file with a link to your Mail trash. The archive stores all the deleted messages lurking there, and it’s searchable via Spotlight. All-in-all, MailWing relieves you of the burden of having to decide when to get rid of outdated messages. You can just keep everything in local folders or in the archive, limited only by the size of your drive. MailWing requires Mac OS X 10.5 or later. 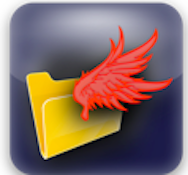 The app is available for a free 30-day trial; during the free trial, the Mail-Safe Archive feature is not available. The activation key runs $10.